The built-in webOS Clock app has had an interesting, if uneventful history. It was bundled along with the webOS 1.0.2 update, appeasing all the "where's the alarm clock?!" cries. Since then, not much has changed. Sure, there's a new "Classic" theme with webOS 2.0, and there's the secret preference options, but it's fundamentally an app not too many care about or use. Myself, I'm part of the minority who love the Clock app and use it regularily. So when I had the opportunity to work with 2 amazing homebrew clock theme makers, I took it. And so for the past few weeks, myself, warlord9159, and kdubhotsauce have worked together on giving the Clock app some new style. 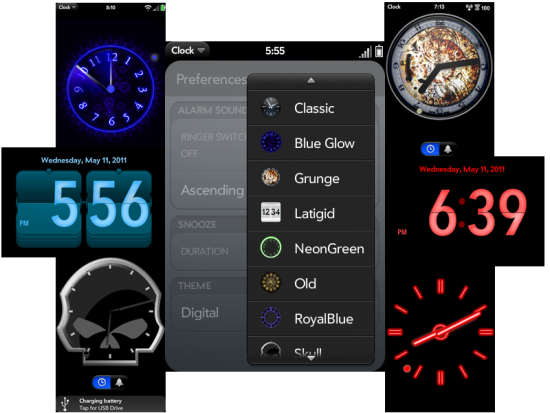 First off, I'm proud to announce the immediate availability of the full-featured, WebOS Clock Theme Builder. Palm designed the Clock app with expandability in mind. So using this theme framework and some symlink trickery, I've created a hombrew clock theme format, harnessed by the theme builder. Just specify a theme base (or go completely original with your own), then customize the clock theme with your own images. It's simple, and best of all, clock themes created with this format are OTA friendly and no system images are overwritten (as system theming is notorious for). Find out how-to do it all after the break. Then all current and future themes will appear in WOSQI/Preware in the Themes section. Chances are there will be at least one that will catch your eye. And if you've created a theme of your own, contact me and I'll add it to the feed. So now you've got a new clock theme and want to show it off? To help with that, I've created 2 patches that together once installed will add the Clock app to the exhibition mode dropbown list. A nice way to add a flavour of style and customization to a clock while on the touchstone. Interestingly, it appears Palm may have had similar plans for webOS 2.0. While working on the patches, I accidentally looked through the 2.0.1 ROM at first (meant to look in the 2.1.0 ROM) and noticed that there appears to be some dock mode code included and 5 new themes! They've since disappeared with webOS 2.1.0, but provide an interesting insight into Palm's thinking. And while I can't legally redistribute those themes, it's not too difficult to use the theme builder and a 2.0.1 webOSDoctor to make the themes yourself. There you have it: new looks for the clock, and a new touchstone-based usage for the clock. It's not groundbreaking, but it is a fun, creative, and safe way to style an aspect of your device. If you'd like to show your appreciation, consider a donation to myself, warlord9159, and kdubhotsauce. Update: A bug with webOS 1.4.5 compatability has been discovered and is being worked on. For now, it'll be webOS 2.x only, folks.